There was a prince who wanted marry a princess. But he couldn't decide, because he wanted to marry a real princess. The prince set out to travel the world to search a real princess. He took with him many clothes and his cousin, Fred. They hadn't gone far when they found that anyone hid under the seat. It's Peg! She was a palace maid. Why? It's so surprised! She said that she wanted to go adventure. Freg argued that Peg shouldn't come with them, but it was too far to come back to them palace. So she joined them. They visited the witch's house to ask how to search a real princess. The witch was known to so terrible by everyone, but she may know everything. The prince knocked the witch's door and the witch opened the door. She was not terrible. She taught them how to search a real princess. First, politeness to one and all. Second, kindness to rich and poor. Third, very sensitive skin. 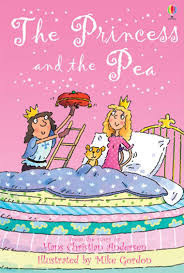 The witch explained about the third, " she could feel a pea under twenty mattresses if she is a real princess. She feasted lunch, but the taste is so terrible. The prince and Freg couldn't eat, but Peg ate it. She said " I didn't hurt the witch's feelings." They visited many princesses to search a real princess, but nobody passed the test. But Peg was kind to beggar, too. I didn't know why written the sentence about Peg's kindness. They returned their palace. Peg was scolded by the cook and she have to wash many dishes. She couldn't sleep the day. Next day, she must clean the bed for the test. She was so sleepy and slept there. She found the bed is too hard because she had very sensitive skin. The prince was surprised that! He said " Peg is a real princess. Peg, will you marry me?" I was so surprised! The prince married the maid! This book is in the Usborne Young Reading series. It has cute illustrations. I recommend to read this book. Hans Christian Anderson.(2007). The Princess and the Pea. London: Usborne. The poor woodcutter had two children. 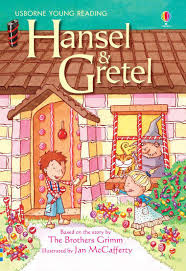 Their name was Hansel and Gretel. They were so poor, so them stepmother wanted to leave them in the forest. One day, the family go out to the forest. Hansel found his mother want to leave them to the forest, so he collected stones and drop them the way. I think Hansel is clever! Hansel and Gretel left the forest, but they could go home. Them stepmother was annoyed and she decided to take them deeper into the forest. Them father was disagreed this, but she ignored him. Next day, them stepmother took them to the forest. Hansel didn't have stones, so he dropped his bread. They started to go home, but the bread was eaten by bird. They couldn't go home. It's a pinch! They wandered the forest and they found the house of sweets! It looks delicious! They met the resident and the resident gave them many sweets. They thought she is kind, but she wanted to eat them. They noticed this and Gretel beat her. Gretel is so brave! They took some jewels and many food to the house. The birds showed them the way home. They could home! Them father was overjoyed and the stepmother was not there. She left and lived in a new brick house. They lived happily. I felt happy! This book is in the Usborne Young Reading series. It has cute illustrations. I want you to read this book. The brothers Grimm.(2005). Hansel and Gretel. London: Usborne. This book has four stories. I'll introduce the one of the favorite stories. The title is "The band of robbers". One day, the wizard and the goblin were walking together in the woods. They didn't see a robber creeping behind them. The robber hit the wizard's head with his club and he shouted "Give me your gold! "I think they were so poor because they were robbed them money by the robber and the witch was injured. After that, they went to the castle to ask for help. The queen wrapped the wizard's head in bandages. The king and the queen were threatened by the robber. The wizard and the goblin wanted to help the king and queen, but they thought it is difficult. But the goblin never gave up and gathered leaves. The wizard came up with the spell to see many leaves. I didn't know what happened. Next day, the robbers came to the castle and request money. The king and queen didn't have money, but they could find many money. Why? They didn't know that, but they felt happy. The robbers felt happy to get a lot of money, but they changed leaves! The wizard spell is changing leaves to money temporarily! It's so surprise! I felt happy to see the robbers. They couldn't get money! This book is in the Usborne Young Reading series. It has nice illustrations. I want everyone to read it. Christopher Rawson.(2007). 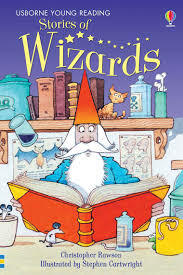 Stories of Wizards. London:Usborne. The ghost appeared in the opera house. 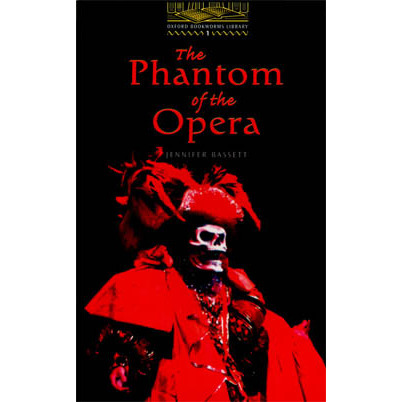 The ghost was called "the phantom of the opera". A lot of mysterious things was happened by the phantom. It's so terrible! First, the phantom sent letter to the people who is in charge of the opera house. The contents of the letter is that they should pay money for the phantom and they ought to free 5 box for the phantom. If they don't do that, terrible thing will happen. They were so angry because they couldn't understand why they should do that. I think so. Second, one famous opera singer couldn't sing and young singer sang instead of her. The young singer was not famous, but she was getting popular soon. Why the famous singer couldn't sing? Anyone knew the reason. The young singer could sing like a angel. She got new music teacher. Who is the teacher? It's mysterious. After that,the young singer fell in love with a man. She told that her new music teacher is the phantom.The phantom is not ghost but a man! It's so surprised! The phantom loved the singer and he wanted her to marry him, but the phantom let her free. I didn't know why he did so? He could catch her and kill her lover. It's difficult for me to understand. I think this story is difficult,but interesting story! Jennifer Bassett.(2000). The Phantom of the Opera. England: Oxford. First, a wealthy lord built the castle like a tower to protect the villagers. They were made by wood, but wooden castles burned too easily. Many lords thought wood is not good, so they began to built castle by stone. The castle was safe, but it was dark, noisy, cold, and smelly. The purpose of the castle was to defend enemy, so there were many system to do it. For example, The gate had a trap to catch enemy, the roof had holes to throw stones to enemy, ...etc. I found that the castle was a place to fight for enemy, to cerebrate for win, to live and protect ourselves. At first, I thought castle is king's house, but castle is not only king's house, but also the rich's house. I learned about the history of castle. It's so surprised! This book is in the Usborne Young reading series. 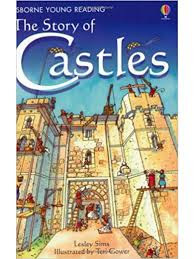 It has cute illustrations, and it has lots of interesting information about the history of castle. I want everyone to read this book. Lesley Sims.(2006). The Story of Castles. London: Usborne. One winter, there was very little food on the farm. They were hungry, so they had to move. they decided to go to Juicy Fields. They had to cross a bridge to go to there, but terrible troll live near the bridge. Youngest and middle goats were so terrified. I wonder Troll live in there is truth? Were they safe? The oldest goats got separated from his brothers. I worried about them. The youngest tried to cross the bridge. The troll was appeared!! It's so scary! The troll was hungry. The youngest said that my brother is taster than me, so troll waited for the goat. The middle appeared. Troll was so hungry. The middle said my oldest brother is the fattest. I think they were so miserable. They are cowards! The oldest appeared. Troll tried to eat him, but the oldest was so strong. he won the troll. It's so amazing! He became a hero! I was so surprised! This book is in the Usborne Young Reading series. It has cute illustrations. I want everyone to read this book. Jane Bingham(2004). 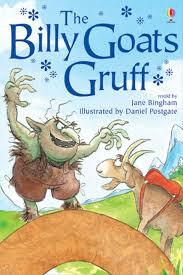 The Billy Goats Gruff. London: Usborne. An young woman is died by a man. The man is a killer, Mac. One day, A man came to see Mac to ask a job. The man told Mac about parallel world. Mac living the parallel world is a priest. It's difficult for me to understand.Who is the woman? Does she have relation to this story? 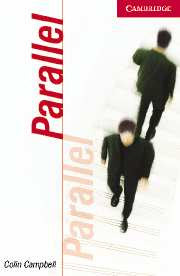 Parallel world? Why this world's Mac and Parallel world's Mac do different job? The man said that if you work for me, I'll take you parallel world. The man and Mac came parallel world by mysterious train. I think it's so mysterious to go to parallel world by train. Mac met Parallel world's Mac. He ask him that "Why he became priest? " He answered his parents died by car accident and he was so angry about that. When he went to church, He wasn't getting angry. So he is become priest. Mac was shocked. After he met the priest, he met a woman he killed. The man said that the woman is my daughter. I don't know what the story tell the reader. I think this story is very difficult. This book is in the Cambridge English Readers series.